Fading into the infrastructure of the bustling Via de’ Cerretani and set in the shadow of Brunelleschi’s dome, Santa Maria Maggiore may just be the most forgettable church in Florence. The typical passerby would likely skip by the church, without notice, on his or her way to the Duomo or to the train station. 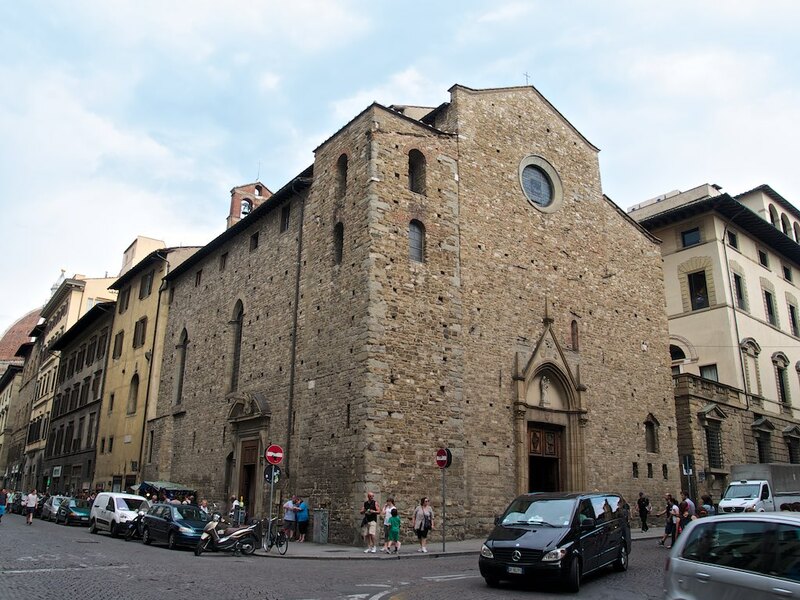 Today, I think it’s time we give one of Florence’s oldest churches (some argue the oldest) a little love. With over 1,000 years of observing Florentine history churn outside her unfinished stone walls, you know this chiesa must have at least a story or two up her sleeve. 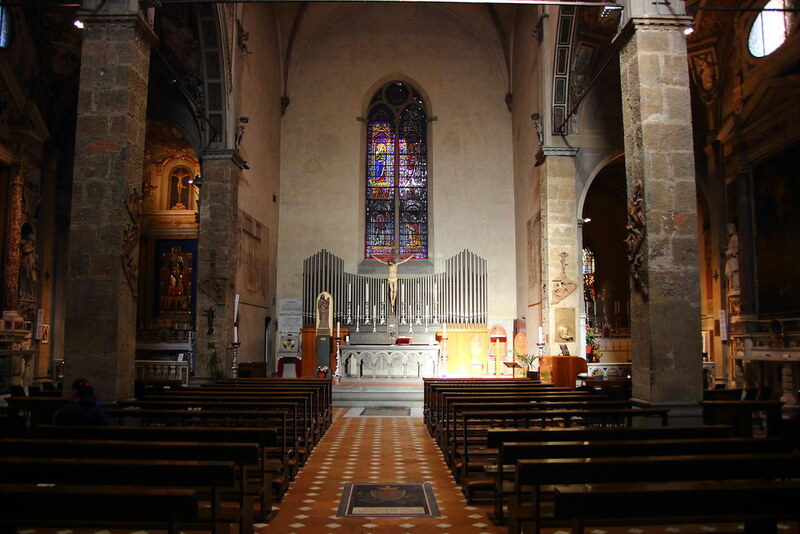 Find the quiet church from the most recognizable spot in the city, the Duomo. From here head out the northwest side of the piazza on Via de’ Cerretani. After only one block, find the unfinished church on your left at the corner. Like any church in Italy, mind opening hours and don’t forget about siesta. The first formal record of Santa Maria Maggiore is found in the year 931, but sources on when the actual construction of the church occurred are conflicting. Let’s just settle on this: she’s old. In her early history, she was passed between the public, the pope and a religious order. Eventually the church settled down with the Cistercian order in the 13th century, at which point it was remodeled in the Gothic style. Don’t be fooled, however–those exposed stone walls are the originals. In 1514, the finances of the church were deteriorating at such a rate that the structure was passed to the property of the Cathedral. Six years later, the Carmelites moved in with even more remodels in mind. The interior of the church leaves something to the imagination. Fragments of frescos can be found on the ceilings and walls, leaving you to piece together the gallant tales of Mary and Florence’s own St. Zenobius depicted. Exposed and rough pillars remind us of the ancient skeleton which continues to support the structure today. This church has a way of both saddening me, as I wonder of her former glory, and inspiring me with her beauty–the type of beauty that only comes with age. After you’ve let your eyes do the wandering and your imagination do the restoring, head to the chapel to the left of the altar. Here you will find a curious wooden relief of the Madonna Enthroned. With such foreign features, Florentines attributed the work to a Byzantine artist. Only recently have art historians reattributed the work to one of Florence’s own 13th-century artists, Coppo di Marcovaldo. The work of art doubles as a reliquary, containing relics of Christ’s blood and pieces of the true cross. In the same chapel, look for the tomb of Brunetto Latini. Uncovered in the 18th century, this is the burial place of the renowned philosopher, scholar and Dante’s adopted father. It’s just one example of the history that literally lies in the walls of the Santa Maria Maggiore. 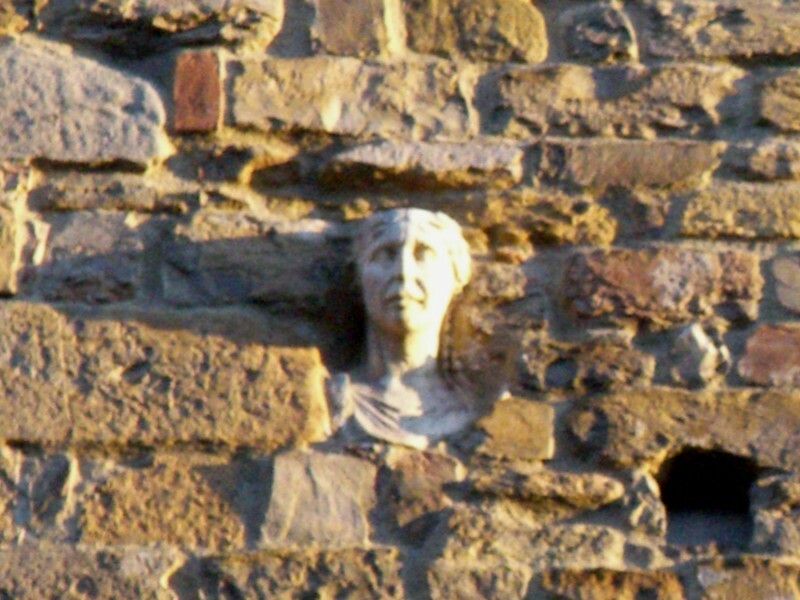 Before you head back to the beaten path just outside the door, make sure to check out the legend that lives on the exterior north wall of the church. Notice anything a bit occult? How about the small disembodied head emerging from the wall high above the street? Although Florentines have spun many theories about the head, the most common attributes its existence to a cursed monk. As the legend goes, a man accused of sorcery was being dragged to Piazza Santa Croce to meet his death by being burned alive. As he passed by Santa Maria Maggiore a monk leaned his head out a small window and shouted to the crowd below not to give the man a drink as it would prevent him from dying. When he said these words, the angry heretic cast a spell on the monk which turned him to stone and trapped his head on the side of the church for eternity. Santa Maria Maggiore is a beautiful fragment of Florentine history that is so often lost in the bustle. In a town that is largely driven by tourist revenue, it is possible to forget that the city was not built for the pleasure of backpackers and to fulfill the fantasies of 20-somethings studying abroad. Rather, it is an ancient city, steeped in history, and home to countless formative figures. Santa Maria Maggiore is a humble reminder and beautiful glimpse into the ancient and understated roots of Florence. P.S. Yes, this is the church that Snooki passed during Jersey Shore season four, in which a priest told her to “put the girls away.” He clearly doesn’t watch the show. Well done Hannah. I- like you- love the little things that the “tourists” seem to so easily pass by. But, I have to remember that I too was a “tourist” once. Now that I have visited my beloved Florence several times, I like to look for things I missed the last time. There is always something new to discover. Will put this on the “too do” list for our visit in November. Thanks for sharing such a great bit of information!